The parties settled during trial for $4,000,000.00. 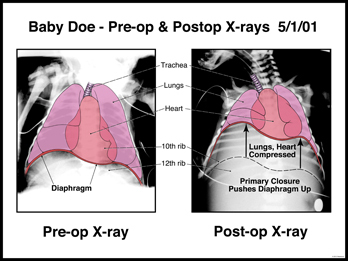 Westwood’s recognition of the pre- and post-op conditions shown on x-ray and his accurate, persuasive case exhibits were instrumental in bringing about this result. 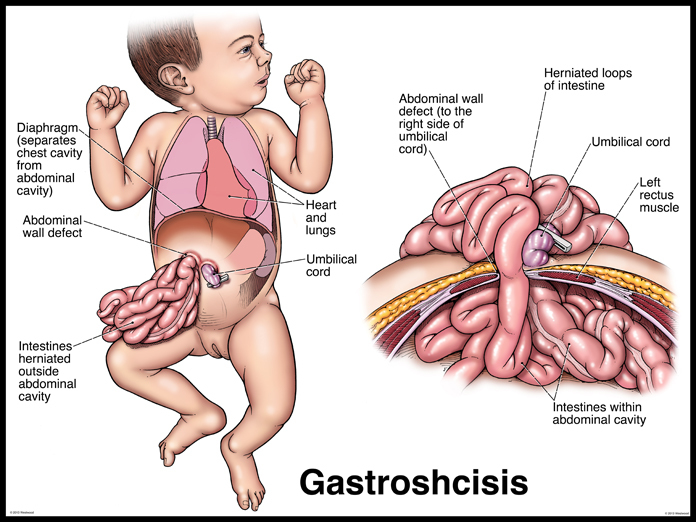 Baby Doe, was born with gastroschisis, a birth defect where a hole occurs in the abdominal wall, allowing the small and large intestines to extend outside the body (Figure 1). 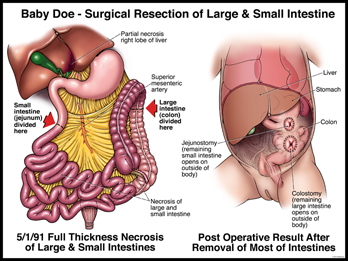 Two surgical treatment options exist for this condition: a “Primary Repair”, where the intestines are placed back into the abdomen all at once and the hole in the belly closed; or a “Staged Surgical Repair”. This second option is used when the abdominal cavity is too small to accommodate all the intestines at once. A clear silastic pouch “silo” is placed over the herniated bowel for protection and over a period of 5-10 days the intestines are placed back into the abdominal cavity a little at a time, until everything fits back in. It was known pre-natally that Baby Doe had this defect, but at birth, the hospital’s pediatric surgeon was away. 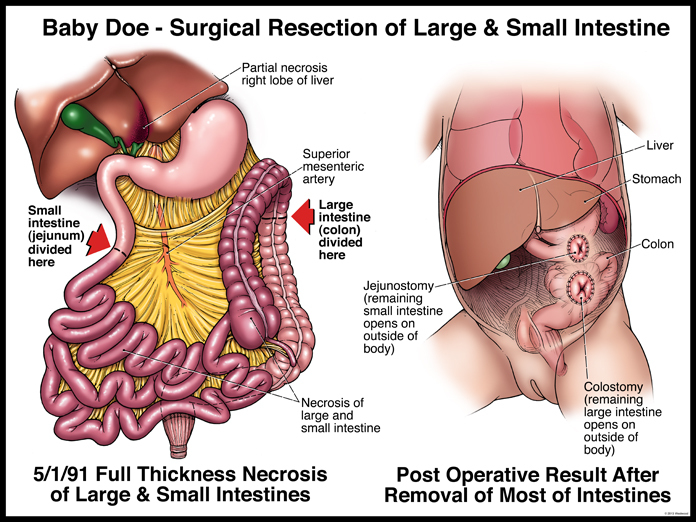 Though inexperienced in treating this condition, two of his surgical colleagues performed a primary closure (Figure 2). This resulted in Baby Doe’s losing virtually all of her small intestine and half of her large intestine. She was left with a jejunostomy and a colostomy postoperatively (Figure 3). The plaintiff claimed that the primary repair caused excessive pressure on the baby’s intestines, compressed her heart and lungs and restricted her breathing for 31 hours, compromising her blood oxygenation levels and leading to extensive intestinal tissue necrosis. They also failed to perform a timely second operation. 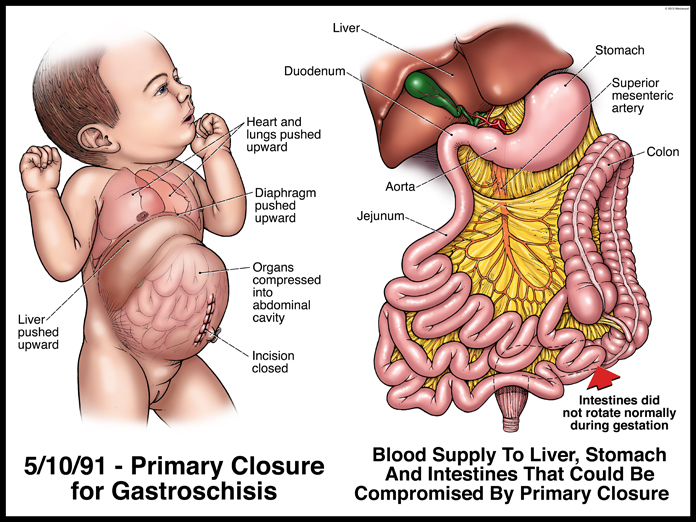 The defense claimed that the baby’s bowel was “predestined” to failure and that damage to the intestinal blood supply occurred in utero, not as a result of the surgical repair technique. They denied the one stage procedure could have caused the baby’s subsequent respiratory distress or that they delayed too long with the second operation. 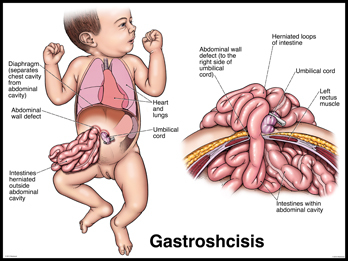 The plaintiff team’s challenge was to show that the surgeons’ actions did damage the baby’s intestines. But no one on the had been able to advance a specific theory of injury likely to overcome the defendant’s claim that the bowels were damaged in utero, or their denial that undue postoperative pressure restricted the baby’s breathing. Reviewing the operative reports and pre and post-op x-rays, Westwood noticed that the typical distribution of the superior mesenteric artery supplied almost the exact portions of the intestines that had been injured. He posited that forcing the bowels back into the abdominal cavity had kinked, compressed or otherwise cut off the blood flow to the segments of intestine supplied by this major artery. Review of the abdominal and chest x-rays provided a counter to the “in utero injury” and the “no respiratory distress” claims. In the pre-op x-rays, the diaphragm, heart and lungs were in normal positions. In the post-op x-rays, the thoracic contents were seen to be extremely compressed (Figure 4). By placing these x-rays side by side with illustrative overlays, the severe result of the primary closure became obvious and understandable. It dramatically supported the contention that the primary closure resulted in excessive pressure on the intestines, heart and lungs, leading to intestinal gangrene and necrosis.